It appears that Pixel suffered enough damage that they will not be able to repair it in time to fly again today. Still waiting for official word, but all indications over the radio loop indicate that Armadillo will not try to fly again today. John Carmack said in a brief press conference that this problem was similar to what they had been seeing in recent testing, with the LOX valve opening quickly and the fuel valve slowly. This creates a very lean mixture that caused the nozzle to burn through. They have enough parts to fix the vehicle but decided that they want to step back and figure out what is causing the problem rather than rushing another attempt. 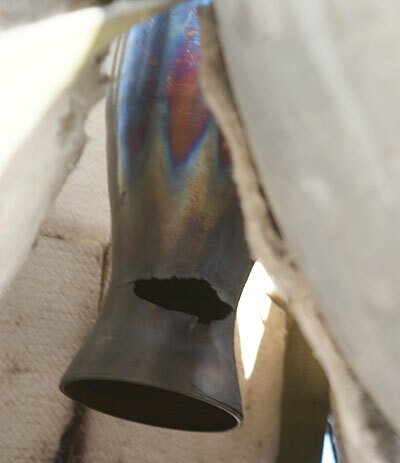 Below: an image of the Pixel engine nozzle that was damaged in this morning’s attempted flight. That looks like an engine ready for manned flight! Maybe when their reliability, construction practices, and performance improves the FAA will start to take them seriously. Armadillo had to run leaner than they wanted (FAA rules), and had to delay their testing (again, FAA). Maybe Armadillo will be able to demonstrate their full capabilities when the FAA quits being so bureaucratic, and not equating tethered flight with free flight. Maybe you guys aren’t up on current events, but they knew they had a fuel valve problem going in and simply lacked enough testing time to diagnose and fix it. Why did they lack testing time? Because the tethered flight rules recently changed – two or three months ago – requiring a full flight waiver even for tethered testing. Their planned test program was held up by the sudden and poorly-timed additional need to seek additional permits. You can test a fuel valve problem on the ground, you don’t need tethered flight let alone a license to fly free. Blaming the FAA only gets you so far. Then again, this isn’t the first time they used that excuse nor will it probably be the last. Joe Blow: you don’t work in any industry that requires testing, do you? Anytime you make *any* change to the vehicle, you need to requalify it with test flights. Lots of them, covering all parts of the envelope. Even for changes which “shouldn’t matter”. What Alan Dewitt was saying was that they didn’t have enough test time to *requalify* their vehicle after *any* change they made. So it doesn’t really matter whether the fix could be independently tested on the the ground or not — they didn’t have time to retest *the complete system* after making the change. So they ended up pretty much flying last year’s hardware. But this time with more luck.